Browse » Home » Earth Change » Giant oarfish caught by Vietnamese fishermen – Consequences of earthquakes? Giant oarfish caught by Vietnamese fishermen – Consequences of earthquakes? An angler in central Vietnam has caught a 4.2 meter long fish, believed to be an oarfish, while he was fishing near the coast of Thua Thien-Hue Province. A 61 years old fisherman, Nguyen Van Anh, 61, battled with one of his friend 30 minutes to pull the fish, which weighed almost 30 kg, off the water onto the shore on May 30, 2014. It is the first time both saw this kind of fish, as reported by Thanh Nien News. 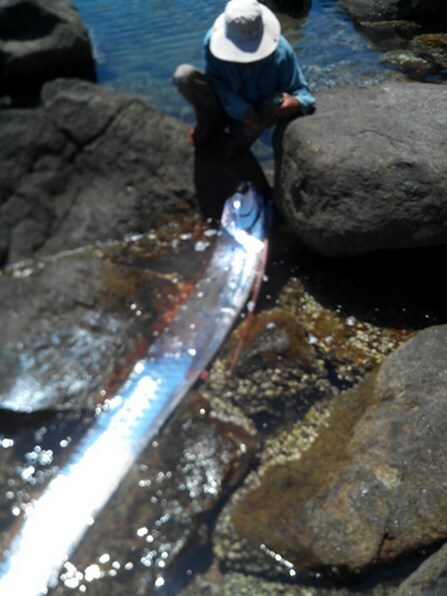 Oarfish is recorded as the world’s longest bony fish, according to Wikipedia. Its shape is ribbon-like, narrow laterally, with a dorsal fin along its entire length, stubby pectoral fins, and long, oar-shaped pelvic fins, from which its common name is derived. Its coloration is silvery with dark markings, and its fins are red. Its physical characteristics and its undulating mode of swimming have led to speculation that it might be the source of many “sea-serpent” sightings. Oarfish usually live in deep-waters. So what is alarming is the reason why the sea serpent was so close to the shore. About 30 tremors were registered between Indonesia and Phillipines on May 30, 2014. Was the fish habitat disturbed by these rumblings?